Alastin Skincare is known for its anti-aging skincare with a Restorative Skin Complex. The Restorative Skin Complex with an ingredient called TriHex Technology, is the flagship product of the Restore and Renew line. It helps to restore and maintain skin health for vibrant and youthful appearance. The emollient formulation has key ingredients to hep volumize and lift aging skin. Synergistic ingredients combat all visible signs of aging for the face, neck and decolleté. The goal of this product is to keep skin looking younger for as long as possible. Restorative Skin Complex with TriHex Technology helps to support the skin's natural ability to produce new, healthy elastin and collagen. It restores volume to plump up thinning skin. Improves the appearance of fine lines and wrinkles in aging skin. It has potent anti-oxidants to help protect the skin from further damage. And finally, it helps even out skin tone. The key ingredients in the Restorative Skin Complex are: TriHex Technology, Phosphatidyl Serine, Palmitoyl Dipeptide-5,L-Ornithine/Phospholipids/Glycolipids,Phytoene, Phytofluene and Niacinamide. Most of those I don't recognize. They are peptides, phosoplipids and other anti-aging ingredients but I do recognize Niacinamide, which is Vitamin B3. To use: apply two pumps each morning to face and neck. Avoid getting into eyes. If contact occurs, rinse thoroughly with water. Use under a product that contains sunscreen, such as their Broad Spectrum SPF 30 Sunscreen. I liked this very much. I used it in the morning under my sunscreen with my foundation. I found that it made my skin feel softer, look smoother and helped my skin look younger. It has anti-aging ingredients in it, so it should help the skin look younger. 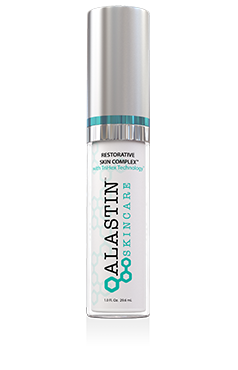 Lately I have been using great products on my skin that have been helping it look rather good and the Alastin Restorative Skin Complex is just one of those skin products. It is a rather good one too. It does not take long to notice changes, just a couple of weeks. Alastin Skincare is sold online through www.alastin.com. Like Alastin Skincare on Facebook:https://www.facebook.com/alastinskincare; Follow Alastin Skincare on Twitter:@AlastinSkincare; Follow Alastin Skincare on Pinterest:https://www.pinterest.com/alastinskincare/ and Follow Alastin Skincare on Instagram:https://www.instagram.com/alastinskincare/. Alastin Skincare was just named Best Topical Skincare of 2016 by The Aesthetic Guide in the publication's second annual Aesthetic Industry Awards. It is because of Alastin's TriHex Technology and how it works with a lot of its products.